As you probably know I was wondering why I'm seeing different shade of Flying Dragon as mine I showed you here. Kindly Elchy send me her version of Flying dragon, so I did a quick comparison today. Can you see the differenc? I'm sure you can, it's obvious! They are different! I was right! So, on my pinkie and middle finger is a Flying dragon from Elchy and on ring and point finger is mine. 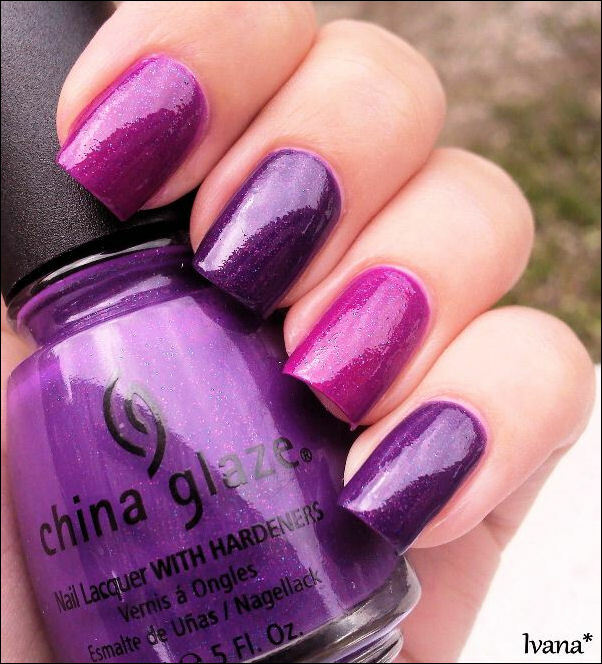 I add 2 coats of her and 3 coats of mine. As you can see, her version is darker and more opaque mine is lighter and little less opaque. 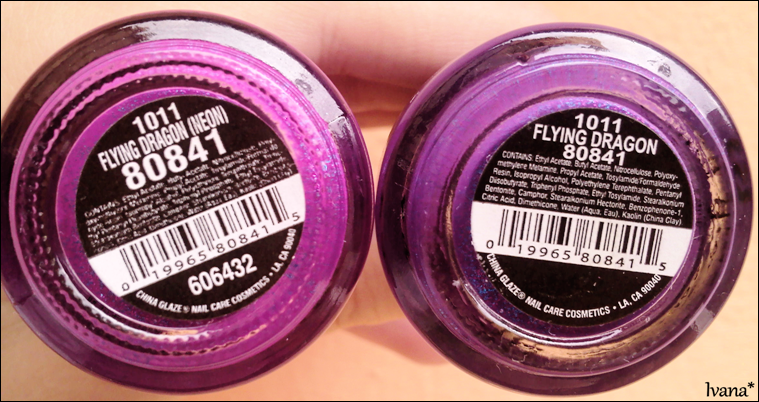 But both have pink and purple glitter, just base color isn't the same. And here is also the picture of the bottles and I'm done. Difference is obvious. Name - a little difference is also present. Mine has neon in the name as Elchys doesn't have but I don't know how they both look like under black light. So, that's it! Which one do you like more? Thank you Elchy again for sending me your version, now I'm sure that I was right! Yaay! Why I didn't believe that this could be purple which is just hard to capture its real color? I take all my pictures with a phone camera and I captured quite a real color. I'm sure some bloggers have even hundred times better digital cameras, so capturing this color shouldn't be a problem and no one said that in real was different as usually we do if something goes wrong with taking pictures. I've only seen the lighter version and I think I like that one better, too. Though, if I were to come across the darker version, I might pick it up, too, just for fun. Like Megan, I've only ever come across the neon version but would get the darker one if I saw it. Both have their charms but I think the darker is more wearable for me. I have Purple panic (neon), I wonder now if there is a purple panic non neon?. I didn't know there were two versions but I have the neon version and love it. Wow! I have the brighter version, that darker one is AWESOME! I found your blog today because I was looking at my bottle of Flying Dragon, which used to be a bright purple and it has now changed into a darker plum-ish purple. I didn't know the formula varied so much or that the color would "age" in the bottle. So strange! Thank you for taking the time to leave a comment here, I really apreciate every comment I get! Please do not spam my comments with the links to your blog, especially if you are here just to paste the link. Thank you for understanding! Essence - Just rock it! What happened with Essence preview post? Click on the picture to see more details! Copyright @ Ivana. All rights reserved. Powered by Blogger.